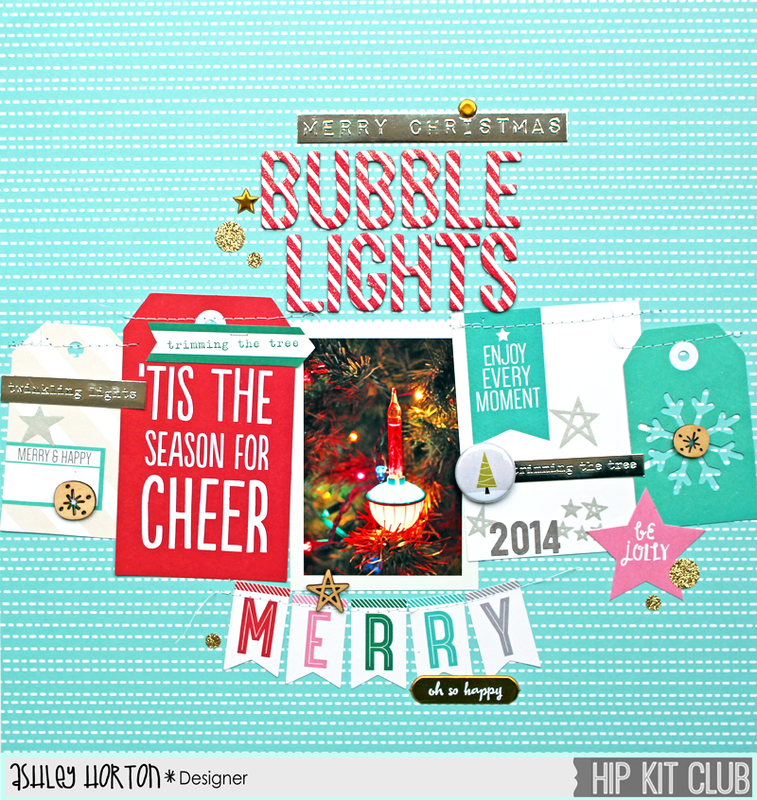 It's time to share a little more Christmas cheer, with a new layout and card for Hip Kit Club, using the November 2014 Hip Kit and Add-On Kits! This Kit makes it so easy to scrap your holiday photos and if you love to make hand-made Christmas cards, then you've got plenty of goodies to create some amazing cards! The November 2014 Hip Kit & Add-On Kits, includes one of my favorite layout accessories...TAGS! I decided to mix the American Crafts Bits Tags and Elle's Studio Good Cheer Tags, to create a banner look across my page. I laid out the tags, to find out a size for my photo and once I had my photo printed, I attached the tags and photo across the page. Then I used my sewing machine to stitch across the top of each tag. I embellished with some of the Elle's Studio wood veneers, Pink Paislee stickers, Studio Calico rub-ons and one of the Evalicious Flair Buttons. And I used the American Crafts Candy Cane Thickers, for the title of my page. I'm always so excited to see the alpha options in each month's new Hip Kit! The November 2014 Hip Kit & Add-On Kits, includes four alpha options. I thought it would be fun to mix them for the sentiment on my card. 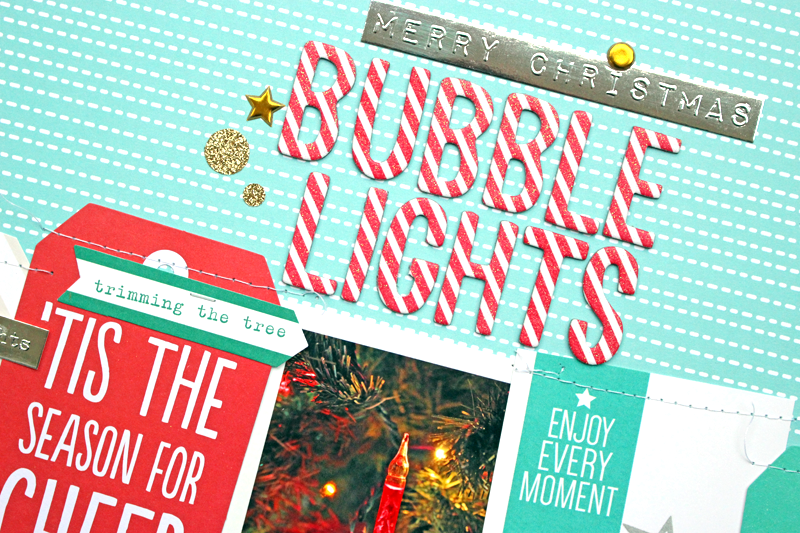 I used the Candy Cane and Buckaroo Thickers, along with the Elle's Studio Gray letter stickers, to create the Ho Ho Ho Merry Christmas sentiment on my card. I cut my White cardstock base at 4.5x9 inches, to create a square shaped card. And to add a little twinkle, I layered some of the Studio Calico star rub-ons in the background, before adding my Thickers and letter stickers. 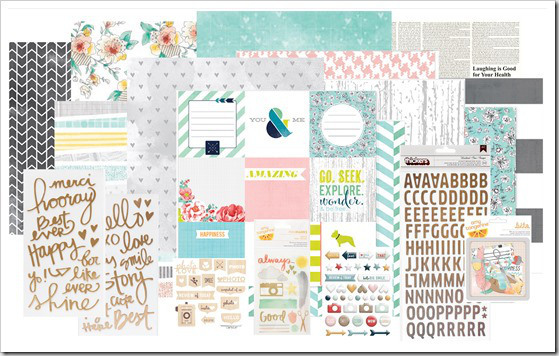 And if you're excited for the December 2014 Hip Kit & Add-On Kits, then the wait is up! It's been revealed and is so awesome! It's packed with lots of American Crafts goodies, including the new Amy Tan Stitched collection and Dear Lizzy Serendipity collection! You can find the December 2014 Hip Kit Main Kit, along with all of the Add-On Kits in the Hip Kit Store!